Be the envy of parents everywhere. If you have nieces and nephews aged from 7 to 14, have them join the first ever King Julien’sDance Off! Upload the group’s dance video at cityofdreams.com.ph/dreamplaydanceoff from June 4 to 30. A dozen groups will be selected as semi-finalists and only six groups will compete in the Grand Finals on July 16 at the Grand Ballroom, City of Dreams Manila. Get a chance to win over a hundred thousand worth of prizes. King Julien himself will be performing in the event and will celebrate with guests in this momentous activity! Get your dough and create a unique balloon-shaped gingerbread cookies together with his buddies Shrek and Donkey! Let the kids engage in some healthy competition with a splashing race down the river using their very own seafaring vessel. This will be happening from June 11 to July 17 at 11AM, 3PM,and 7PM. Kids can sit back and relax while watching Megamind: The Button of Doom. Catch DreamPlay's newest 4D movie experience at DreamTheater. If they don’t feel like catching the film, then take them to create one instead at Dream Studio with the new Penguins of Madagascar module. Who doesn’t like a good pop-up show, especially when there are popular DreamWorks characters joining the performers? This is what dreams are made of! A consummate favorite among kids, this workshop will help them tap into their creative side. Have the opportunity for your children to have a printed photo with Shrek, Fiona, Alex, Po, and King Julien anytime between 12PM and 7PM. Don't forget to squeeze in, okay? The afternoon of June 11 is packed with various, fun Flow activities. Take your pick and make wonderful memories with the kids. 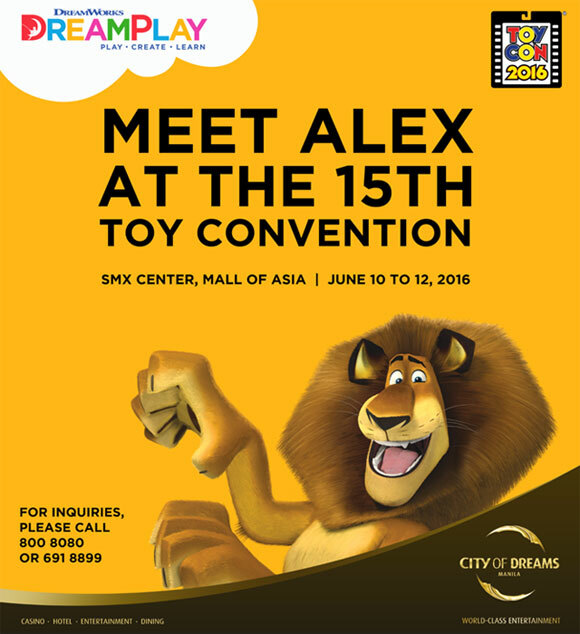 Drop by the 2016 Toy Convention happening at the SMX Convention Center from June 10 to 12, and continue the DreamPlay celebration there. The children will love it! Follow City of Dreams Manila on Facebook to know more.